The Game Boy was an 8 bit handheld by Nintendo. Released in 1989, it was Nintendo's second line of handheld gaming devices, preceded by Game & Watch. 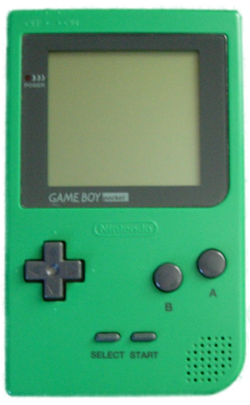 The Game Boy was launched alongside Tetris and Super Mario Land, and was also the home of such popular games as the first generation of Pokémon games, The Legend of Zelda: Link's Awakening, and various ports of earlier and contemporary games. The Game Boy has undergone two redesigns in the form of the Game Boy Pocket and the Game Boy Light (Japan only). All three systems play the same games. 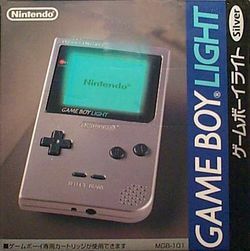 The Game Boy Light was only released in Japan towards the very end of the system's life. Its light was able to turn off, and it used 2 AA batteries which lasted roughly 20 hours of gameplay with the light off and 12 with the light on. It is about the size of the Game Boy Pocket and only played Game Boy games (not Game Boy Color games). 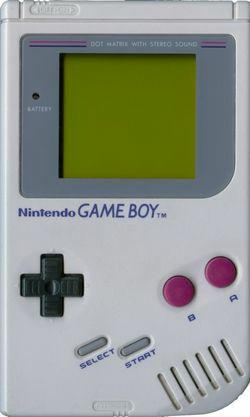 The Game Boy Light was Nintendo's only handheld with an integrated backlight until the release of the DS in 2004. Pages in category "Game Boy"
Ganbare Goemon: Mononoke Douchuu Tobidase Nabe-Bugyou! This page was last edited on 26 April 2015, at 02:03. This page has been accessed 53,641 times.